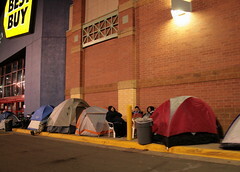 I am always amazed at the number of people who camp out days before Black Friday at store to make sure they get the best deal possible on what they want. It’s something they want for themselves or someone they love. It’s important to them enough to be inconvenienced this way. In the big picture, the best deals in life are peace, joy, mercy and grace. You don’t need to line up to receive these for yourself or for all you love. It is freely given by One who was greatly inconvenienced by dying on a cross on Good Friday. His love for us put Him on the cross willingly. Are we thankful for God’s love that we are willing to express it in worship and godly living, or is it too much of an inconvenience? Faith Tip: Today consider how you can express your love for God and live it out. How has God blessed me this past week, month, and year? The list seems infinite and it probably is for I take notice of some blessings, but others I miss. There are the blessings of provision, the miraculous healing of a friend, new writing jobs, and more that I quickly take notice of and give God praise. However, what about all the blessings I miss or take for granted? God works in all the details of our lives. He blesses us all abundantly if we just take notice of all the blessings. So as we gather to give thanks tomorrow, let’s remember those things that we may have not mentioned or thought of for they are important. It’s vital to let God know that we are thankful for all the things he has done in our lives. The praising may go on for awhile and that’s okay. In fact, I think it’s very good. Faith Tip: Take some time to really give thought to all that God has blessed you with. Be encouraged by the great love God has shown you. Last night, my sister gave me a wrapped Christmas gift. It’s not even Thanksgiving yet, but to start out the season, she wanted to give me this fun gift. 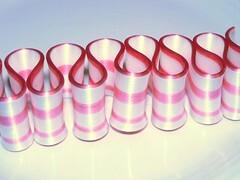 I wondered what it could be and opened it to find one of my favorite treats … ribbon candy. We opened the box and broke off a few pieces as we were listening to Christmas music. It was fun and such a nice surprise. It made me feel special. The gifts that God has for us are wrapped up in the Scriptures. As we read and pray for illumination, our eyes are open to the truth that God has meant for us. Digging into the verses allows more of the gift to be experienced. It was meant just for you at that moment. Doesn’t that make you feel special? Faith Tip: Take some time to unwrap the gifts God has for you today in his word. 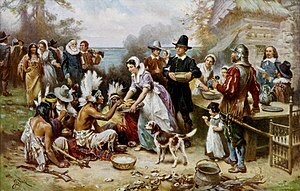 In this season of Thanksgiving, we remember the things in which we are thankful. As you make your list, either written or mentally, do you find that you are thankful for fights or quarrels? Usually not. What we can be thankful for are the times when reconciliation is experienced. Jesus said, “Blessed are the peacemakers.” He didn’t say blessed are the peacemakers only if they are right. So isn’t it more important to experience peace then to be right? In a situation of disagreement you are experiencing right now, where you feel you are right and the other person is wrong, are you willing to give up your “rightness” and place it at the foot of the cross for the sake of reconciliation? If not, you may want to ask yourself why it is so important to hold on tightly to being right. Where is the focus…on you or God? Faith Tip: Consider the relationships in your life that need reconciling. Pray for direction and be obedient to what God tells you. “We need to cheer again?” I asked my young niece as we were in between plays of bocce ball at a family picnic. “Yes!” she exclaimed, “We need to cheer every time!” We would then go into our crazy cheer that we made up. I considered it my aerobics for the day. It truly was a delight to have such fun with my three nieces. There is something about a child being happy to see you, giving you a hug, and wanting to play with you. It delights my heart. I think this is how God is delighted when we are happy to be with him, giving spiritual hugs in praise and thanksgiving, and wanting to do something with him. It delights his heart as well as ours. You know how you want to give good gifts to children. Well, God knows how to give good gifts to us, his children. They are always perfect. He knows exactly what we need at every moment. Faith tip: Spend some time today delighting in the Lord.